Happy Three Day Weekend….. WooHooooooo! If you are not fortunate enough to have a three day weekend like me…well then my deepest apologies for my greeting. Anyways, unto the real reason why you payed me a visit. The card I have for you today….. I can not take credit for this brilliant idea. I saw this a ways back on Pinterest and this is my interpretation of it. This card was given to a co-worker at my school. After I made this card…I also made a replica of it on a giant piece of Construction paper and we hung it up at the surprise shower we had for her at work. Of course I do not have a photo of it (insert sad face here). It was even cooler than the card, because I couldn’t run it through an embossing folder (lol) so I punched out about 30 flowers and they were glued on the dress instead. They popped up and looked 3-dimensional. It looked really great! You will have to trust me on this! I am entering this card in a challenge over at Addicted to Stamps and More…this is a new blog I stumbled upon and I enjoy playing along with them. The challenge was to use Black and White with a splash of color if you want to. Go check them out and give them a try! 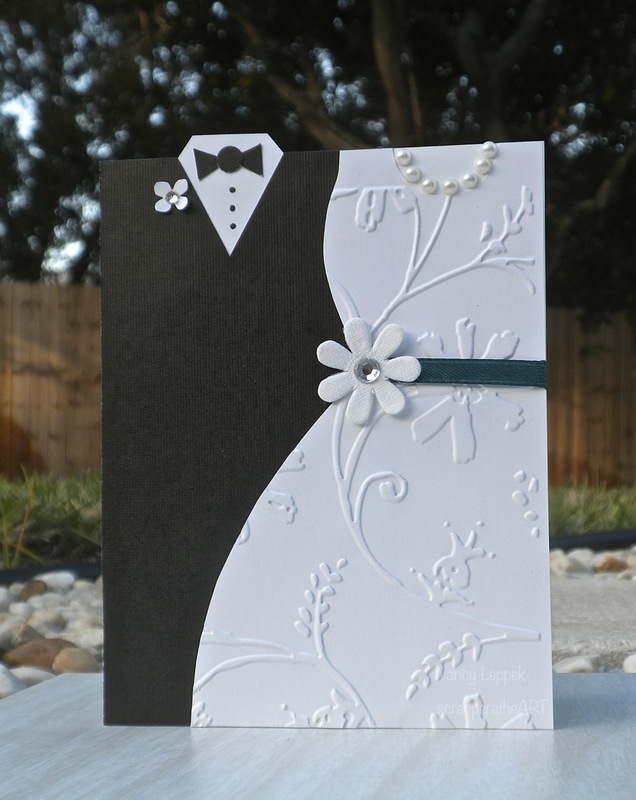 Categories: Cards, challenges | Tags: Card making, Cards, color challenge, embossing, love, wedding card | Permalink. What an absolutely DIVINE card there lady!! I LOVE this!!! You create the most awesome layouts and designs! Amazing! Woo0HOO!! I’m off for the long weekend too!!! Yippee *doin’ the happy dance* Can’t WAIT to get together!! Oh how cool!! I’m sure the big version looked amazing as well. Thanks for joining us at ATSM Challenge this week! Hi there – this is sooooo coool – I LOVE it. I too am going to have to CASE this fabulous idea. Isn’t it awesome that we have access to so many wonderful ideas and avenues to inspire us and spark our creativity?! You;ve done that for me today :o) Thanks for joining us this week at Addicted to Stamps and More! What a beautiful card indeed! Will you share the template? Congrats on your winnings! Marcia…I would share a template if I had one I just drew it on card stock! Thanks for the sweet comment!